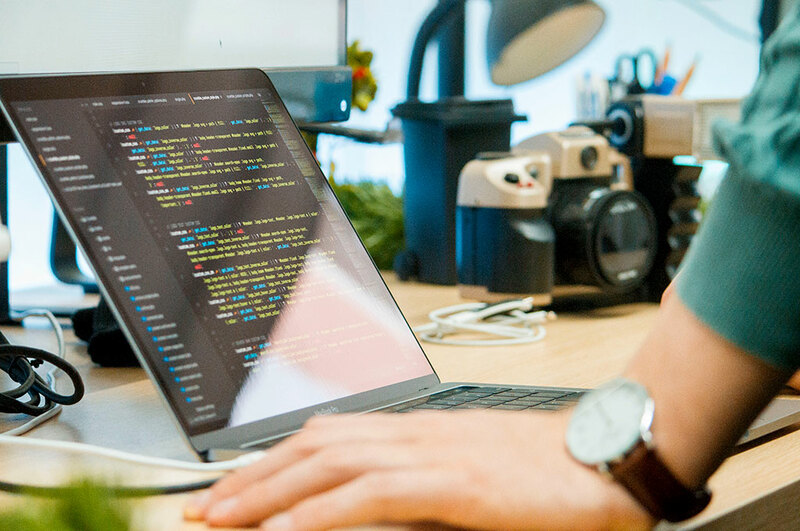 Front-end development and back-end development are the two main facets under the umbrella of ‘web development’, but are very distinct and require a very different skillset. Hypertext Markup Language (HTML) is at the heart of any website. All websites must contain HTML because it is used to specify the format and layout for a webpage. Essentially, it’s about tagging the content on a webpage in order to define what it is and how it should look. For instance, <h3> is used to represent a particular header format, while <img> can be used to embed an image. The same goes for tables, colour, spacing, navigation, and much more. For a time, HTML was the only way to format web pages. This caused problems because changing certain web layouts would mean many edits to the HTML code. CSS was created to help, taking care of the look and feel of the website by differentiating the content from the styling. CSS – or Cascading Style Sheets – allows developers to more easily control font options, columns, background images, layout designs, variations in display for different devices (responsive), and much more. It can’t be used to create a website on its own, but it makes a significant difference to the presentation options in an HTML document. Since front-end development involves the elements that users interact with, you can probably surmise that back-end development involves the elements you can’t see. But what does this actually mean? The back-end – sometimes called the ‘server-side’– is responsible for storing and organising data and making sure the front-end elements work properly. When a user does anything on a website, the front-end sends a request to the back-end, which then sends information to be displayed as a web page. This is the most popular language used in back-end development. It was purpose-built for the web and is used to pull and edit information in the database. PHP was the foundation for sites like WordPress, Drupal, and Facebook and has become incredibly popular thanks to its ease of use, compatibility, and scaling proficiency. Microsoft’s .NET framework is the most popular framework on the web, and C# is the language it speaks (so to, uh, speak). Its productivity and versatility make it the ideal choice for building Microsoft applications. It can also build applications for iOS and Android with the help of cross-platform technology. It’s used by sites like GoDaddy, DELL, and Ancestry.com. Python’s programming language is very fast and easily readable compared to other back-end web languages. Its fewer lines of code combined with its relative simplicity makes it a great place to start for beginners, but it’s also extremely adept at working with object-oriented designs. Python is very popular, being used by sites including Google, YouTube, Reddit, and Instagram. Front-end and back-end developers need to be in sync in order to implement the webpage design, so it’s essential that they collaborate with one another. If you have any questions about web development or are interested in how Dusted can optimise your business website, get in touch via our contact page.